When Roopali Bhasin came in for her 6-year-old son’s check up, she was visibly tense. “When I saw my son’s class picture yesterday, I was disturbed to see that he was the shortest in the class” said Roopali. Roopali‘s son Aryan was examined by a pediatrician, and his height, weight and BMI were noted to be short for his age. He was then referred to Dr Manu Aggarwal, Pediatric Endocrinologist at Sitaram Bhartia. Roopali had many questions when she met the pediatric super specialist. 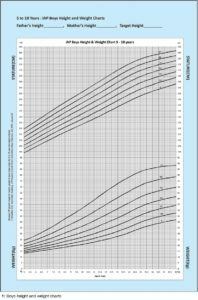 What is Normal Height Gain in Children? Children aged 4 to 9 years usually gain about 2 to 3 inches a year. How should I estimate the genetic potential of my child’s height? Source: Khadilkar VV, Khadilkar AV. Revised Indian Academy of Pediatrics 2015 growth charts for height, weight and body mass index for 5-18-year-old Indian children. Indian J Endocr Metab [serial online] 2015 [cited 2018 Sep 23];19:470-6Roopali was extremely worried when she was told Aryan’s was not as tall as he should be. The pediatrician suspected Aryan’s condition because he had grown only an inch from the previous year, as compared to the usual 2-3 inches for a child his age. “It is important for you to get a medical opinion as early as possible, as treatment becomes not so effective or completely ineffective as the child grows older,” emphasizes Dr Manu. What can I do now that I know my child is short? The treatment for children who are not growing adequately depends on the condition with which they are diagnosed. If your child is diagnosed with malnutrition, the pediatrician will advise you on how to encourage a balanced diet and may also prescribe supplements. “We usually advise blood tests to measure the thyroid-stimulating hormone (TSH) or thyroxine (T4) to confirm whether a child has hypothyroidism” explains Dr Manu. The pediatrician endocrinologist will also feel your child’s neck to assess the presence of an enlarged thyroid. This is known as Goiter and may cause difficulty with breathing or swallowing. If confirmed, the child would be started on thyroid hormone therapy on a daily basis. Children with a slow rate of growth due to genetic causes may also be advised growth hormone therapy. After a thorough examination, Aryan was advised blood tests. The blood tests revealed that his pituitary gland wasn’t producing enough growth hormone. Growth hormone deficiency may be present at birth or could be acquired after birth due to brain tumors, injections or injury. At times, there is no identifiable cause. “Growth hormone therapy aims to increase the rate of growth in children, their metabolism and their energy levels” says Dr Manu. “As treatment is expensive, you have to make sure you follow it properly as it can be effective only if followed through,” cautions Dr Manu. After a lot of discussion with the pediatric endocrinologist, and speaking to her husband and family, Roopali decided in favour of growth hormone therapy for her son. Aryan was advised injections on a daily basis. Dr Manu monitored Aryan’s growth periodically. In the next two years Aryan showed tremendous improvement in growth and still continues to be on track. We hope you found this article helpful. If you have any questions about your child’s height and are unsure of what to do, don’t hesitate to reach out to us.